Just enter your zip code or full address below to find out what free HD channels you can receive in your area. This tool will work in the USA and Canada. After you enter your zip code or address, click the map this button. You will then be presented with stations and broadcast towers that are available in your area. Then continue to scroll down the page to select the proper color coded antenna for your area. *By checking off “show lines pointing to each transmitter” the map will generate the location of the broadcast towers. This will help to select and point the antenna in the proper direction. The stations listed in the results are only the primary broadcast stations. Many of these primary stations also broadcast subchannels. For example, channel 4.1 will also have subchannels 4.2 and 4.3. Each of these sub channels broadcasts separate content. So you may receive more channels than listed above. Monthly channel scans on your TV are recommended to obtain the latest over the air channels. The FCC started an auction designed to re-purpose television airwaves for wireless companies. TV stations are moving to new frequencies between 2018-2020. This repack will affect over 1000 channels. For more information on the FCC auction, you can check out their website. To see if your area is affected enter your address at the FCC DTV reception maps. Each station listed above is classified by a color code and distance from the broadcast towers. Use the color chart below and distance (Dist mi) to determine your antenna. Please see our recommend antennas below. Just plug the antenna into the back of your TV. by ANTENNAS DIRECT(R) Antennas Direct, Inc.
Directional antenna, good if broadcast towers are in one area. It can be mounted outdoors for longer range. Multi-directional antenna, for homes with broadcast, towers on opposite sides. Provides signals from two locations. Omni-directional antenna, for broadcast towers in many directions. Multi-directional antenna, for homes with broadcast towers on opposite sides. Provides signals from two locations. Directional antenna, good if broadcast towers are in one area. by 1byone 1Byone Products Inc. Combine your OTA antenna with an over the air DVR. This will allow you to record all of your favorate OTA content to veiw at a later time. Some of these boxes will also allow you to stream content from the internet by using many of the popular streaming apps. By using a streaming box in conjunction with your HD antenna, you can save money. All you need is an Internet connection and you can start streaming. Say goodbye to expensive cable bills! There are many affordable streaming packages available like Sling TV, Hulu, Fubo TV, You Tube TV, Direct TV Now, Amazon Video and Netflix. Alternatives to Cable TV Using Live TV Streaming Services. How To Get Rid of Cable One Step at a Time Guide. If You Need Help Selecting An Antenna. Please Leave a Comment Below. If you need help selecting an antenna. Feel free to leave a comment. Am I able to get tv @ Port Lorne, Nova Scotia? I did a search and looks like you can get a few channels with a roof top antenna. Channel list: CBHFT-5,CBHT-6,CJCHTV1,CIHF-TV-5,CIHF-TV-6,CJCHTV6,CBHFT-6,CBHT-7,CJCH-13. Most of the broadcast towers are spread out. You may want to consider a rotary roof mount antenna, so you can point the antenna in the right direction. Example here: http://amzn.to/2qm0FxY. Good luck! I just got a Hue bridge for home automation which needs to be plugged into my internet router. By doing this I just lost 3 OTA channels. I have a Mohu indoor antenna on the way to replace my older one. Unfortunately I cannot more my router to a different location. Is there anything that an help cut out WIFI signals from interfering in my TV reception? There are some filters that can cut out wireless interference, mostly from cellular towers. It maybe a power interference problem. It could be electromagnetic interference from the power in the house, due to the extra load of the home automation bridge. You could try unplugging power one by one and see if the problem goes away or use a power conditioner to clean up the power. Here is an example of a power conditioner: http://amzn.to/2BUeASf. If you want to try an antenna filter Channel Master makes a few. Here is one I recommend: http://amzn.to/2zhffuh. It will filter out cellular interference but may also work on wireless routers as well. I hope this helps. Good luck. Who do I contact about the moving of the channels??? I bought a $50 tuner to work on my xbox. And it worked fine until they moved the channels out of my tuners range!! It was fine, why move it? Anyone who used their xbox as a tuner will be in the same boat. The FCC has rebranded some frequencies. It does not affect all areas. It’s a process of reclaiming some frequencies for other uses, then moving some channels to a new frequency. You can see our article about rescanning your channels and why the FCC is making changes: http://www.overtheairdigitaltv.com/ota-tv-channels-moving-time-rescan/. Some of the new channels may not be broadcasting at the power the where formally. It could be a weaker signal that may require an amplifier or a larger antenna. I was under the impression that I would receive at least 20 channels with my anntena. I sometimes receive 4 or 5 and on occasion, 6 . Can you please help me to figure out which anntenea would work best in my home? I did some research and it looks like that most channels you can receive is about 12. This is with a long range antenna. Here is one I would recommend. ViewTV Outdoor Amplified Digital HDTV Antenna. It would be awesome if you could add “Pointing direction” to the channel listing. That way I would know exactly which direction to point the antenna when I’m on my roof. There is an option that you can check off allowing it to “show lines pointing to each transmitter”. It is just below the generated map. This will give you the locations and direction of each broadcast tower. This can help you point your antenna in the right direction. Hope this helps. Would a multi-directional or directional be better ? I assume I will need a distribution amp also. I would use a multi-directional antenna like the ViewTV outdoor motorized rotation antenna. You would also need a splitter something like the Channel Master 4 port DA. Mount the antenna as high as you can using a good pole mounting system and bracket. Hope this helps. I was able to enter your address and had no problems getting results. Just make sure to add your postal code. Also in the drop-down option for state select ON for Ontario. The results said you could obtain about 16+ channels. I would recommend an attic or rooftop antenna. Like the Channel Master CM 4228HD 8-bay HDTV or the ClearStream 4MAX TV Antenna. Thank you Johan. I believe it is was an internet glitch that stopped the results from populating. It worked after I tried a few more times. Cheers! Hello, we will be canceling our cable in a few weeks and just running the internet (Mbps) along with Streaming from possibly Sling TV. We have Samsung Smart tv’s one is 4k. I would also like to be able to connect to local channels. The map seems to show that I should be able to have access to these channels with an antenna. the address is (removed for privacy). 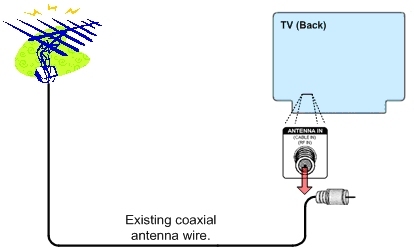 Not only are we trying to ensure we have the right antenna, we would like the antenna to be connected to a few tv’s if this an option of using just one antenna with multiple tv’s? if so, what antenna options should we be looking at? preferably indoor/outdoor. we’ll most likely use indoor but would like to have the option of outdoor, if needed. We came across ANTOP AT-403B Flat-panel Smartpass Amplified Outdoor/Indoor TV while online. also, I see that there are options for amplified and non amplified. not sure what I should choose here. Help!!!! I ran your address. It looks like most of the towers are in 30-40 mile range so the antenna you are looking at will work fine. That antenna will give you the option to set it up indoors or outdoors. You can start using it indoors and experiment with the placement. If you are not happy with the results you could try mounting it outside or in your attic. As far as splitting the antenna signal it will require a splitter. I have an article explaining how to set it up. How to split an OTA antenna signal to multiple TV’s. Good luck and I hope this information is of some help. I live in Butte Mt. In a trailerhouse.moutains all around. Will one work for me. It looks like you can only get about 4 channels. CBS, NBC, ABC, and PBS. You would need an outdoor antenna. Something like or similar to the Channel Master CM-4228HD would work best. Hello Johan, I want to drop cable at the end of my promo so I bought and connected a Clearstream 4 antenna to mess around with and tried it indoors in various spots. I was able to pick-up over 30 channels. The one eludes me is NBC. I’m mainly interested in the major stations. I get ABC, FOX, CBS and others. I was thinking of removing the dish on my one story house (which I had at one time) and using the mount and the cable for a outdoor antenna. I live in Canton, GA 30115. Every antenna review you read on line is the greatest! Can you recommend one that would serve my purpose and be good enough to split the signal to 2 TV’s (not watched at the same time). Thanks for any suggestions you can provide. The Clearstream 4 is an excellent antenna. You could use the mount and the cable from your old dish setup. You should get a great reception. If you want to split the antenna signal just add a splitter after the antenna amp if there is one. You could use the existing wiring from your dish setup to distribute the signal. I have an article explaining the setup. This would allow you to watch different channels on each TV. Each TV has separate tuners. Your address showed that you should get all the major stations using the current antenna you have. As far as not getting NBC. If you mount the antenna outside you may have better luck. It could also have been part of the FCC rebanding program and may have moved. Sorry to hear about your frustrations. There is a PBS station closer to you, WLIW channel 21. It is about 8 miles away. The FCC is also repacking and rechanneling a few stations that could also be causing problems. This repacking will be going on for some time. It does not affect everyone. Just in certain areas. To get the most current updates to go to the FCC website and enter your address to see what channels are affected.